Although the machinery of government was almost the same under the Second Empire as it had been under the Napoleon I of France, "who had sprung armed from the French Revolution like Minerva from the head of Jove", as the guardian of the social gains of the revolutionary period. The anti-parliamentary French Constitution of 1852 instituted by Napoleon III on January 14, 1852, was largely a repetition of that of 1848. All executive power was entrusted to the emperor, who, as head of state, was solely responsible to the people. The people of the Empire, lacking democratic rights, were to rely on the benevolence of the emperor rather than on the benevolence of politicians. He was to nominate the members of the council of state, whose duty it was to prepare the laws, and of the senate, a body permanently established as a constituent part of the empire. One innovation was made, namely, that the Legislative Body was elected by universal suffrage, but it had no right of initiative, all laws being proposed by the executive power. This new political change was rapidly followed by the same consequence as had attended that of Brumaire. On December 2, 1852, France, still under the effect of Napoleon's legacy, and the fear of anarchy, conferred almost unanimously by a plebiscite the supreme power, with the title of emperor, upon Napoleon III. For seven years France had no democratic life. The Empire governed by a series of plebiscites. Up to 1857 the Opposition did not exist; from then till 1860 it was reduced to five members: Darimon, Emile Ollivier, Hénon, Jules Favre and Ernest Picard. The royalists waited inactive after the new and unsuccessful attempt made at Frohsdorf in 1853, by a combination of the legitimists and Orleanists, to re-create a living monarchy out of the ruin of two royal families. On 2 December 1851 Louis-Napoléon Bonaparte, who had been elected President of the Republic, staged a coup d'état by dissolving the National Assembly without having the constitutional right to do so. He thus became sole ruler of France, and re-established universal suffrage, previously abolished by the Assembly. His decisions and the extension of his mandate for 10 years were popularly endorsed by a referendum later that month that attracted an implausible 92 percent support. A new constitution was enacted in January 1852 which made Louis-Napoléon president for 10 years and concentrated virtually all governing power in his hands. However, he was not content with merely being an authoritarian president. Almost as soon as he signed the new document into law, he set about restoring the empire. In response to officially-inspired requests for the return of the empire, the Senate scheduled a second referendum in November, which passed with 97 percent support. As with the December 1851 referendum, most of the "yes" votes were manufactured out of thin air. The empire was formally re-established on 2 December 1852, and the Prince-President became "Napoléon III, Emperor of the French." The constitution concentrated so much power in his hands that the only substantive changes were to replace the word "president" with the word "emperor" and to make the post hereditary. The popular referendum became a distinct sign of Bonapartism, which Charles de Gaulle would later use. 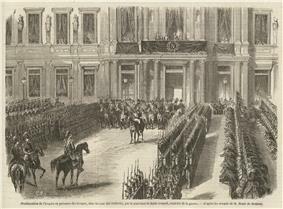 The official declaration of the Second Empire, at the Hôtel de Ville de Paris, on December 2, 1852. 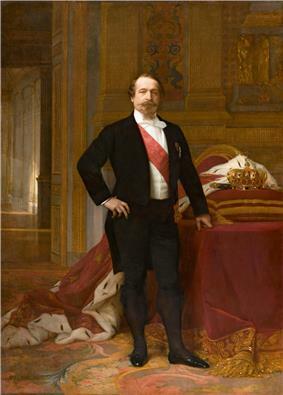 Napoleon III's joy was at its height in 1856, as the Crimean War resulted in a peace which excluded Russia from the Black Sea, and when his son Eugène Bonaparte was born, which promised a continuation of his dynasty. In 1859, Napoleon led France to war with Austria over Italy. France was victorious, and gained Savoy and Nice, but the idea of Italian unification - based as it was on the exclusion of the temporal power of the popes - outraged French Catholics, who had been the leading supporters of the Empire. A keen Catholic opposition sprang up, voiced in Louis Veuillot's paper the Univers, and was not silenced even by the Syrian expedition (1860) in favour of the Catholic Maronite side of the Druze–Maronite conflict. On the other hand, the commercial treaty with the United Kingdom which was signed in January 1860, and which ratified the free trade policy of Richard Cobden and Michel Chevalier, had brought upon French industry the sudden shock of foreign competition. Thus both Catholics and protectionists discovered that authoritarian rule can be an excellent thing when it serves their ambitions or interests, but a bad one when exercised at their expense. But Napoleon, in order to restore the prestige of the Empire before the newly awakened hostility of public opinion, tried to gain from the Left the support which he had lost from the Right. After the return from Italy the general amnesty of August 16, 1859 had marked the evolution of the absolutist or authoritarian empire towards the liberal, and later parliamentary empire, which was to last for ten years. Napoleon began by removing the gag which was keeping the country in silence. On November 24, 1860, he granted to the Chambers the right to vote an address annually in answer to the speech from the throne, and to the press the right of reporting parliamentary debates. He counted on the latter concession to hold in check the growing Catholic opposition, which was becoming more and more alarmed by the policy of laissez-faire practised by the emperor in Italy. The government majority already showed some signs of independence. The right of voting on the budget by sections, granted by the emperor in 1861, was a new weapon given to his adversaries. Everything conspired in their favour: the anxiety of those candid friends who were calling attention to the defective budget; the commercial crisis, aggravated by the American Civil War; and above all, the restless spirit of the emperor, who had annoyed his opponents in 1860 by insisting on an alliance with the United Kingdom in order to forcibly open the Chinese ports for trade, in 1863 by his ill-fated attempt of a military intervention in Mexico to set up a Latin empire in favour of the archduke Maximilian of Austria, and from 1861 to 1863 by embarking on colonising experiments in Cochinchina (southern Vietnam) and Annam (central Vietnam). Similar inconsistencies occurred in the emperor's European policies. The support which he had given to the Italian cause had aroused the eager hopes of other nations. The proclamation of the kingdom of Italy on February 18, 1861 after the rapid annexation of Tuscany and the kingdom of Naples had proved the danger of half-measures. But when a concession, however narrow, had been made to the liberty of one nation, it could hardly be refused to the no less legitimate aspirations of the rest. In 1863 these "new rights" again clamoured loudly for recognition: in Poland, in Schleswig and Holstein, in Italy, now indeed united, but with neither frontiers nor capital, and in the Danubian principalities. In order to extricate himself from the Polish impasse, the emperor again had recourse to his expedient — always fruitless because always inopportune — of a congress. He was again unsuccessful: Great Britain refused even to admit the principle of a congress, while Austria, Prussia and Russia gave their adhesion only on conditions which rendered it futile, i.e. they reserved the vital questions of Venetia and Poland. Thus Napoleon had to yet again disappoint the hopes of Italy, let Poland be crushed, and allow Prussia to triumph over Denmark in the Schleswig-Holstein question. These inconsistencies resulted in a combination of the opposition parties, Legitimist, Liberal and Republican, in the Union libérale. The elections of May–June 1863 gained the Opposition forty seats and a leader, Adolphe Thiers, who at once urgently gave voice to its demand for "the necessary liberties". It would have been difficult for the emperor to mistake the importance of this manifestation of French opinion, and in view of his international failures, impossible to repress it. The sacrifice of Persigny minister of the interior, who was responsible for the elections, the substitution for the ministers without portfolio of a sort of presidency of the council filled by Eugène Rouher, the "Vice-Emperor", and the nomination of Jean Victor Duruy, an anti-clerical, as minister of public instruction, in reply to those attacks of the Church which were to culminate in the Syllabus of 1864, all indicated a distinct rapprochement between the emperor and the Left. Assured of support, the emperor, through Rouher, a supporter of the absolutist régime, refused all fresh claims on the part of the Liberals. He was aided by the cessation of the industrial crisis as the American Civil War came to an end, by the apparent closing of the Roman question by the convention of September 15, which guaranteed to the papal states the protection of Italy, and finally by the treaty of October 30, 1864, which temporarily put an end to the crisis of the Schleswig-Holstein question. Things went badly, however, when Prussia defeated Austria in the Austro-Prussian War of 1866 and emerged as the dominant power in Germany. Confidence in the excellence of imperial régime vanished. Thiers and Jules Favre, as representatives of the Opposition, denounced the blunders of 1866 . Emile Ollivier split the official majority by the amendment of the 45, and made it understood that a reconciliation with the Empire would be impossible until the emperor granted entire liberty. The recall of French troops from Rome, in accordance with the convention of 1864, led to further attacks by the Ultramontane party, who were alarmed for the papacy. Napoleon III felt the necessity for developing "the great act of 1860" by the decree January 19, 1867. In spite of Rouher, by a secret agreement with Ollivier, the right of interpellation was restored to the Chambers. Reforms in press supervision and the right of holding meetings were promised. In vain did Rouher try to meet the Liberal opposition by organising a party for the defence of the Empire, the Union dynastique. The rapid succession of international reverses prevented him from effecting anything. The emperor was abandoned by men and disappointed by events. He had hoped that, though by granting the freedom of the press and authorising meetings, he had conceded the right of speech, he would retain the right of action; but he had played into the hands of his enemies. Victor Hugo's Châtiments, Rochefort's Lanterne, the subscription for the monument to Baudin, the deputy killed at the barricades in 1851, followed by Léon Gambetta's speech against the Empire on the occasion of the trial of Delescluze, soon showed that the republican party was irreconcilable. On the other hand, the Ultramontane party were becoming discontented, while the industries formerly protected were dissatisfied with free trade reform. The working classes had abandoned their political neutrality. Disregarding Pierre-Joseph Proudhon's impassioned attack on communism, they had gradually been won over by the collectivist theories of Karl Marx and the revolutionary theories of Mikhail Bakunin, as set forth at the congresses of the International. At these Labour congresses, the fame of which was only increased by the fact that they were forbidden, it had been affirmed that the social emancipation of the worker was inseparable from his political emancipation. The union between the internationalists and the republican bourgeois became an accomplished fact. But the republican party, unlike the country, which hailed this reconciliation of liberty and order, refused to be content with the liberties they had won; they refused all compromise, declaring themselves more than ever decided upon the overthrow of the Empire. The killing of the journalist Victor Noir by Pierre Bonaparte, a member of the imperial family, gave the revolutionaries their long desired opportunity (January 10). But the émeute ended in a failure. This success, which should have consolidated the Empire, determined its downfall. It was thought that a diplomatic success would make the country forget liberty in favour of glory. It was in vain that after the parliamentary revolution of January 2, 1870, Lord Clarendon, Count Beust's plan of disarmament after the Battle of Königgratz. He met with a refusal from Prussia and from the imperial entourage. The Empress Eugénie was credited with the remark, "If there is no war, my son will never be emperor." The rise of neighbouring Prussia during the 1860s caused a great deal of unease within the National Assembly of France, culminating in the July Crisis of 1870. On July 15, the government of Emile Ollivier declared war on Prussia, nominally over the Hohenzollern candidature for the throne of Spain, the pretext for France to declare war in order to satisfy France's increasing unease and desire to halt Prussian expansion in Europe. During July and August 1870, the Imperial French Army suffered a series of defeats which culminated in the Battle of Sedan. At Sedan, the remnants of the French field army, and Napoleon III himself, surrendered to the Prussians on September 1. News of Sedan reached Paris on September 4. The National Assembly was invaded by a mob and during the afternoon of September 4, Parisian deputies formed a new government. At the Hôtel de Ville, Republican deputy Léon Gambetta declared the fall of the Empire and the establishment of the Third Republic. Empress Eugénie fled the Tuileries for Great Britain, effectively ending the Empire, which was officially declared defunct and replaced with the Government of National Defence.